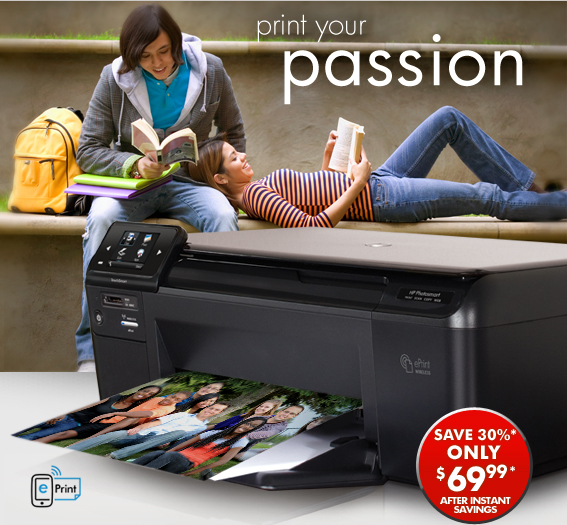 SUPER SAVINGS ON POPULAR PRINTERS! Wirelessc — For your mobile lifestyle! Print from your smartphone, laptop or other mobile device with HP ePrintd on our most popular All-in-One. Plus, save big on all Everyday Value Printers for superior printing at a price you can afford! * Offer is good while supplies last. Offer is also subject tochange or cancellation at any time. See product page for details.Prices shown may include applicable instant savings. Restrictionsapply to sale items and are subject to change without notice.Offer on HP Photosmart e-All-in-One-D110a Printer valid through8/20/2011. Offer on HP Ink & Toner valid through 8/23/2011. **Ink offer is good while supplies last. Must buy 2 single inkseach priced $19.99 or greater or 1 ink multipack. Free $10 HPgift card is electronic and will be delivered via email. Limit 2free gift cards per qualifying order. Offer is also subject tochange or cancellation at any time. See product page for details.Prices shown may include applicable instant savings. Restrictionsapply to sale items and are subject to change without notice.Free gift card offer is valid through 8/23/2011 or while supplieslast. c Wireless performance is dependent on physical environment,distance from access point. d Requires Internet connection to printer. Feature works with anyInternet- or e-mail-capable device. Print times may vary. For alist of supported documents and image types, seewww.hp.com/go/ePrintCenter. If you no longer want to receive the HP Home & Home Office Store emails, please click unsubscribe. To unsubscribe from all marketing emails from HP, including HP Home & Home Office Store, special offers and information, please reply with “UNSUBSCRIBE” as the subject line. For more information about HP privacy practices, read the online privacy statement. To ensure you receive your HP Home & Home Office Store offers, please add news@mail.hpshopping.com to your address book. Need help? Click here. We try hard to make sure all of the information in our email iscorrect, but sometimes mistakes do happen.HP Home & Home OfficeStore is not responsible for typographical errors.